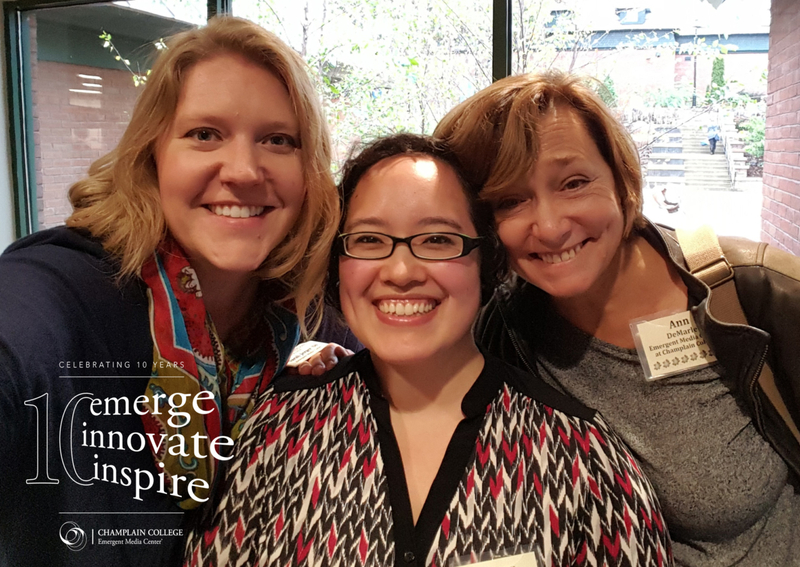 Selfie time with (from left) EMC Operations & Communications Director Sarah Jerger, Lauren Nishikawa ’09, and EMC Director & Associate Dean Ann DeMarle. Former Emergent Media Center Project Manager Lauren Nishikawa ’09 stopped by Alumni Auditorium as a member of the Game Panel at Champlain College’s inaugural 2016 Fall Career Conference, and took some time to chat with us about the tenth anniversary of the EMC. What’s it like to look back on ten years of the Emergent Media Center? It’s just cool to know how many students have gone through the center. It’s a win-win for a student. You’re impacted so much by the work that you get to do, and the people that you’re creating that media for are also impacted in a positive way. Have you poked your head into the EMC since you’ve been here? I went down there this morning, and it was astonishing… in a good way! It’s expanded. It’s way bigger than it was when I was there. I couldn’t even figure out where my desk was previously because the space is just totally different, and you can see that it is just going to continue evolving. How cool is it see that kind of growth firsthand? I think it’s super exciting to know that pretty much nothing that I saw this morning is the same kind of thing that we were doing here when I was a student. What WAS it like for you as a student? My first experience at the EMC was going down to a conference. As a group of four students, we made two games over the course of the three days to advocate for games as something you can apply to other fields, and show people their capacity to teach. What was your biggest project at the Emergent Media Center? The biggest project that I did at the EMC was as a student designer on the Breakaway games. And that’s really cool to see too. When I was still here as a project manager, it had just started getting the teaching materials, and they were starting to plan the first camp with the game. To me, that’s great that something I worked on as a student can also be leveraged by other students to enhance it and keep it alive. What do you think of how the EMC welcomes students who may not have a design background or a gaming background? I think that’s the perfect way to do it. To be smart and really understand media (because it changes so often) the more skillsets and the more background expertise you have, the better. And you, (as an individual who has that different background) are going to think of something that no one else will think of to do with these types of media. Lauren is currently working as a game designer at Deloitte Digital, a global digital consultancy in the Washington, DC area, where she utilizes game design theory as a basis for interactive comics, fluency in IT concepts and phobia exposure therapy. She also put together a sweet video to wish the EMC a happy birthday:!